0.35 , Erratum: The Logic of Poe, College English, 1941. 0.35 Hugh Rank, A Comment on A M Tibbetts on Doublespeak, College English, 1979. 0.34 Min-Zhan Lu, Min-Zhan Lu Responds, College English, 1995. 0.34 A. M. Tibbetts, A M Tibbetts Responds, College English, 1979. 0.32 R. W. French, R W French Responds, College English, 1983. 0.32 Ruth Smith, Further Comment, College English, 1982. 0.32 John Rouse, John Rouse Responds, College English, 1979. 0.32 J. Mitchell Morse, Two Questions for Professor Morse: Response, College English, 1972. 0.31 Shelley Ross, To Mimi Gladstein, College English, 1978. 0.31 Katherine Anne White, A Comment on John Rouse's "Knowledge Power and the Teaching of English", College English, 1979. 0.30 Geoffrey Wagner, Geoffrey Wagner Replies, College English, 1978. 0.30 Edward Proffitt, A Last Word, College English, 1980. 0.30 John Lydenberg, Cozzens, College English, 1959. 0.29 Anthony Wolk, Reply to J Mitchell Morse, College English, 1976. 0.29 H. W. Matalene, H W Matalene Responds, College English, 1989. 0.28 Paul Ramsey, A Comment by Paul Ramsey on His Essay on Teaching the Teachers of Black-Dialect Writers, College English, 1980. 0.26 Reed Way Dasenbrock, Reed Way Dasenbrock Responds, College English, 1998. 0.26 Sam S. Baskett, Distortion in "The (Complete) Scarlet Letter": Reply, College English, 1961. 0.26 Christopher Clausen, A Comment on "The Postmodernism of David Antin's Tuning", College English, 1986. 0.26 W. Ross Winterowd, W Ross Winterowd Responds, College English, 1984. 0.26 Mariolina Salvatori, Mariolina Salvatori Responds, College English, 1985. 0.26 James Sledd, Response to Walter Hickman, College English, 1974. 0.26 E. B. Dike, Improve the Anthologies, College English, 1944. 0.26 Mary Anson Richardson, Comment on Wayne O'Neil "The MLA's MVE Award for 1968", College English, 1971. 0.25 Stanley Friedman, Response to Leonard Greenbaum's Response, College English, 1971. 0.25 Eric J. Ziolkowski, Eric J Ziolkowski Responds, College English, 1997. 0.25 W. Ross Winterowd, W Ross Winterowd Responds, College English, 1988. 0.25 Martin Steinmann_ Jr., Literary Theory; Or Botanizing on One's Mother's Grave: Reply to Sidney Shanker, College English, 1974. 0.25 James J. Lynch, The California Experiment: An Essay in Disbelief: A Rejoinder, College English, 1960. 0.25 Darrel Abel, The Critic as Prosecutor, College English, 1952. 0.25 Anthony Wolk, Anthony Wolk Responds, College English, 1980. 0.25 Gary Sloan, Predilections for Plethoric Prose, College English, 1978. 0.24 E. D. Hirsch_ Jr., A Comment on "Reading and Writing a Text", College English, 1984. 0.24 Richard M. Coe, Comments on Comments on Strunk and White and Sexism, College English, 1981. 0.24 A. M. Tibbetts Charlene Tibbetts, A M and Charlene Tibbetts on the Language Crisis, College English, 1980. 0.23 E. L. Dachslager, E L Dachslager Replies, College English, 1978. 0.23 James Schroeter, Reply to Kenneth S Rothwell, College English, 1974. 0.23 Charles E. May, Reply to Ms Paula Robertson-Rose and Ms Anne Sherrill, College English, 1977. 0.23 Pete Osterhoudt, On "War Words", College English, 1967. 0.23 James L. Funkhouser, Response to Barbara Nauer, College English, 1974. 0.23 Edward M. White, A Comment on Testing, College English, 1983. 0.23 Patrick Hartwell, Patrick Hartwell Responds, College English, 1986. 0.23 Martin Steinmann_ Jr., Darkness Visible: A Reply to Professor Lloyd, College Composition and Communication, 1952. 0.23 Virginia Ogden Birdsall, A Comment on "Distressed Literature: The Antiquing of the Classics", College English, 1989. 0.23 James A. Reither Douglas Vipond, James A Reither and Douglas Vipond Respond, College English, 1991. 0.23 David H. Russell, Reading and Research: Reply, College English, 1962. 0.23 Thomas F. Mader, Testy Thoughts, College Composition and Communication, 1978. 0.23 Marcia Berry, A Comment on the NEH, College English, 1978. 0.22 Wallace G. Gober, Comment on Wayne O'Neil "The MLA's MVE Award for 1968", College English, 1971. 0.22 Bonniejean McGuire Christensen, Mrs Johnson Again, College English, 1971. 0.22 Laurence Behrens, Laurence Behrens Responds, College English, 1980. 0.22 William H. Pixton, The Unblowing Wind: A Recent Defense of Nonstandard English, College English, 1976. 0.22 William Wresch, William Wresch Responds, College English, 1984. 0.22 William J. Linn, Response to Hortense A Sarot, College English, 1977. 0.22 Edward Lotto, Edward Lotto Responds, College English, 1990. 0.22 Roger F. Krueger, A Comment on "Teaching Milton's Poetry", College English, 1981. 0.22 Lawrence W. Hyman, Reply to Joel Magid, College English, 1973. 0.21 Robbins Burling, Robbins Burling Replies, College English, 1978. 0.21 Alan Purves, Alan Purves Responds, College English, 1979. 0.21 David Baker, A Comment on James Vopat on Ken Macrorie, College English, 1979. 0.21 Carol Ohmann, Reply to Rudolf B Gottfried, College English, 1971. 0.21 Ann E. Berthoff, A Comment on "Composing Uniting Transacting: Whys and Ways of Connections Reading and Writing", College English, 1990. 0.21 Hortense A. Sarot, To William J Linn, College English, 1977. 0.21 Patrick Hartwell, Patrick Hartwell Responds, College English, 1985. 0.21 Gay Wilentz, Gay Wilentz Responds, College English, 1991. 0.20 Don K. Pierstorff, A Comment on "Dramatism in Themes and Poems", College English, 1984. 0.20 Eric Bentley, Letter to College English, College English, 1975. 0.20 Margaret E. Ashida Daniel W. Bernd, They Ain't Heavy Chairman; They're My Freshmen, College English, 1959. 0.20 P. A. Ramsey, P A Ramsey Responds, College English, 1981. 0.20 Carl Freedman, Carl Freedman Responds, College English, 1983. 0.20 Judith G. Stitzel, Comment on Granville H Jones, College English, 1972. 0.20 Virginia McDavid, More on Ain't, College English, 1964. 0.20 Louie Crew, To Stanley Weintraub, College English, 1975. 0.20 Stanley Cooperman, On "Art for Man's Sake", College English, 1969. 0.20 Warren U. Ober William R. Seat_ Jr., A Reply to Morse Peckham, College English, 1959. 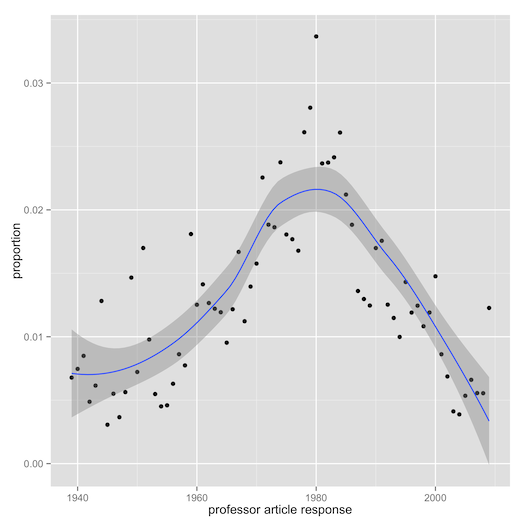 0.20 Richard Ohmann, Reply to H L Anshutz, College English, 1972. 0.19 George McMichael, Microcosmography, College English, 1961. 0.19 Karl Shapiro, Memo from the Muses' Committee on Un-American Activities: Reply, College English, 1964. 0.19 Elda Maase, Comment on Vern Wagner, College English, 1974. 0.19 Claire L. Pelton, On Being Self-Serving: Another Comment on "Going Ape", College English, 1982. 0.19 James Vopat, James Vopat Responds, College English, 1981. 0.19 John Rouse, John Rouse Responds, College English, 1980. 0.19 Roy Harvey Pearce, On "Cold Light and Tumbling Clouds", College English, 1960. 0.19 Granville H. Jones, Response to Judith Stitzel and Raymond Bentman, College English, 1972. 0.19 Rudolf B. Gottfried, Edmund Spenser and the NCTE, College English, 1971. 0.19 Peter Elbow, Comment on Ken Bruffee, College English, 1972. 0.19 William Brown, A Comment on "Teaching Literary Antisemitism", College English, 1978. 0.19 Tim Mayers, Tim Mayers Responds, College English, 2009. 0.19 W. Ross Winterowd, Reply to Robert J Di Pietro, College English, 1974. 0.19 Simon O. Lesser, A Lesser "Byzantium": Reply, College English, 1967. 0.19 Jean E. Kennard, Jean E Kennard Responds, College English, 1981. 0.19 Anthony K. van Riper, Two Questions for Professor Morse, College English, 1972. 0.19 John Champagne, A Comment on "The Class Politics of Queer Theory", College English, 1997. 0.18 Reed Way Dasenbrock, Reed Way Dasenbrock Responds, College English, 1991. 0.18 Henry A. Wicke_ Jr., A Comment on "Going APE", College English, 1982. 0.18 Louise A. De Salvo Marian Price, Two Comments on "Going Home: Selfhood in Composition", College English, 1984. 0.18 Oscar Cargill, In Defense, College English, 1940. 0.18 William B. Stone, Criticism and Ideology: Response to Barbara A Welch, College English, 1973. 0.18 James W. Byrd, Gibson on Perrine, College English, 1959. 0.18 Richard Ohmann, An Academic Field Revisited: Reply, College English, 1967. 0.18 , The Editor Responds, College English, 1999. 0.18 Edward Profitt, 42nd St Ware, College English, 1978. 0.18 Norman Friedman, Pan and Buffalo Bill, College English, 1962. 0.18 Ian Watt, Reply to Michael Reck, College English, 1971. 0.18 Joel Haefner, Joel Haefner Responds, College English, 1993. 0.18 Herbert R. Coursen_ Jr., More Frosting on the Woods: Reply, College English, 1963. 0.18 John Kenny Crane, Reply to James D Johnson, College English, 1973. 0.18 Francis L. Fennell, Further Comment on the Service Course, College English, 1980. 0.18 Wayne A. O'Neil, Grēnefeld grānode; Gōber andswarode pȳ hine forgieldeđ Onela, College English, 1971. 0.17 Derek Soles, A Comment on the "WPA Outcomes Statement for First-Year Composition", College English, 2002. 0.17 Howard C. Key, Author's Comment, College English, 1960. 0.17 Patrick Hartwell, Patrick Hartwell Responds, College English, 1985. 0.17 Martha A. Fisher, An Extra Step: A Comment on Colleen Marshall on the Research Paper, College English, 1980. 0.17 Phyllis Pickens, Phyllis Pickens Responds, College English, 1981. 0.17 Walter J. De Mordaunt, Ransom Pope and the Intentional Fallacy, College English, 1959. 0.17 Helene Solheim Patricia J. McAlexander, Two Further Comments, College English, 1991. 0.17 Kathleen Blake Yancey, [A Comment on the "WPA Outcomes Statement for First-Year Composition"]: Responds, College English, 2002. 0.17 Robert Barton, A Response to Rollin's "Beowulf to Batman: The Epic Hero and Pop Culture", College English, 1970. 0.17 Elaine P. Maimon, A Comment on the Response of C H Knoblauch and Lil Brannon, College English, 1985. 0.17 Patrick L. Courts, A Comment on "Politicizing Literacy", College English, 1993. 0.17 James Schroeter, The Humanities Again: Reply, College English, 1964. 0.17 Milton Birnbaum, Reply to Kenneth A Bruffee, College English, 1974. 0.17 James Vopat, James Vopat Responds, College English, 1980. 0.16 Sheridan Baker, Reply, College English, 1965. 0.16 Robert J. Geist, Anything Goes, College English, 1951. 0.16 Roberts W. French, On Robert E Knoll "English in a Program of Total Innovation": (CE December 1970), College English, 1971. 0.16 Greg Myers, Greg Myers Responds, College English, 1987. 0.16 Susan Gubar, Susan Gubar Responds, College English, 2000. 0.16 Richard Kostelanetz, Richard Kostelanetz Replies, College English, 1978. 0.16 Russell Rutter, Russell Rutter Responds, College English, 1986. 0.16 René Wellek, The New Scholasticism? A Reply to Kenneth Neill Cameron, College English, 1951. 0.16 Anthony Wolk, Reply to William H Pixton, College English, 1976. 0.16 Gary A. Olson, Struggling over Composition, JAC, 2000. 0.16 Paul Kaser Bertram Lippman, Two Comments on Suzette Haden Elgin's "The Top Forty Mistakes", College English, 1983. 0.16 Deborah Holdstein, Deborah Holdstein Responds, College English, 1996. 0.16 Charles Child Walcutt, Reading and Research, College English, 1962. 0.16 Norman Rudnick, Grammar and John Barleycorn (A Partial Answer to "On Semantic Bedevilment and Grammar"), College English, 1976. 0.16 Bruce Franklin, Reply Number Two: On Hearing from Still More Professors of the U S Empire, College English, 1973. 0.16 Carol Ohmann, Northrop Frye and the MLA, College English, 1970. 0.15 Sandra Gilbert, Sandra Gilbert Responds, College English, 1979. 0.15 Carol Johnson, In Reply to Professor Wimsatt's Review of Reason's Double Agents, College English, 1967. 0.15 Margaret Grant Fielders, [Poem], College English, 1963. 0.15 Dwight Purdy, Dwight Purdy Responds, College English, 1987. 0.15 John Chesky, A Comment on Alan Purves' Review of Dillon's Constructing Texts, College English, 1983. 0.15 Karl W. Dykema, Rondeau the Purist to His Incorrigible Pupil, College English, 1962. 0.15 Jacob Korg, A Note on "What Aspern Papers? A Hypothesis": Reply, College English, 1962. 0.15 Edward R. Fagan, Response to Jack E Conner "The Shortest Way with Missenders", College Composition and Communication, 1972. 0.15 Thomas N. Huckin, A Comment on "Grammar Grammars and the Teaching of Grammar", College English, 1986. 0.15 Larry Levy, A Comment on James B Vopat's "Uptaught Rethought", College English, 1980. 0.15 John T. Shawcross Martha H. Cox, On "Maxwell Anderson and Composition and Communication", College Composition and Communication, 1960. 0.15 Carl R. Lovitt, A Comment on "From Astor Place to Kenyon Road", College English, 1986. 0.15 Dorothy Augustine, Dorothy Augustine Responds, College English, 1982. 0.15 Michael West, Michael West Responds, College English, 1986. 0.15 Richard G. Wendell, A Rejoinder to Professors Perrin and McCrimmon, College English, 1949.